Complimentary Dartmoor Cream tea if you book from this web site! On the top of Dartmoor, Tor Royal is an ideal stop over on Dartmoor for a stay in Devon, with direct access onto Dartmoor National Park Tor Royal Farm offers double, single and twin en-suite rooms, with a choice of bath or shower, furnished with period furniture. We also have a ground floor room decorated in Art Deco style. All rooms have tea and coffee making facilities T.V and wi-fi. Breakfast is served in the Royal Suite with local Dartmoor produce where possible, with fruit and veg traditionally grown in the Tamar Valley and when available sausages from the local breed of British Lop pigs. Second floor – Romantic dual aspect room with Super King size bed, en-suite bathroom with shower (again very powerful.) TV and wi-fi. 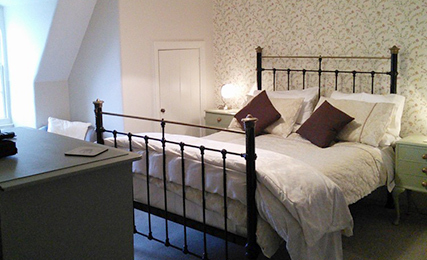 Twin, en-suite bath with shower over, on first floor, looking out over the garden and moors beyond, TV and wi-fi. Second floor – Relaxing and peaceful cream decor with standard double bed – en-suite with shower which will knock your socks off! TV and wi-fi. Over looking the courtyard, this room is decorated in ‘Morrison’ wall paper and has a standard double bed with antique brass frame. There is a T.V – tea and coffee making facilities and an en-suite shower and W.C.